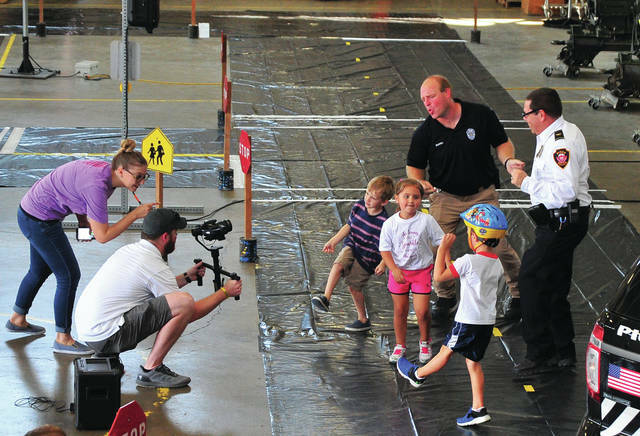 Officer Sean Stein of the Piqua Police Department watches as a group of incoming Piqua kindergarten students use a crosswalk and watch out for traffic in Safety Town 2018 at the Piqua National Guard Armory. Officer Bret Marrs and Chief Bruce Jamison dance with Piqua kindergarten students during the making of the 2018 Our Town music video. Deputy Piqua Police Chief Marty Grove “loses” a fast draw water pistol competition to a young visitor at the 2018 National Night Out in Piqua. A display of memorabilia looking back at the rich history of the Piqua Police Department is set up at the station. The display depicts historical photos, patches, and badges from the past 150 years. The display also contains reminders of the somber side of police work, including photos of Piqua officers who lost their lives in the line of duty, Detective Bob Taylor, Patrolman Jan Mulder II, and Lt. Noah Studebaker. The badge, and uniform accoutrements, that belonged to the first Piqua Chief of Police, Frank Gehle (1869-1939). 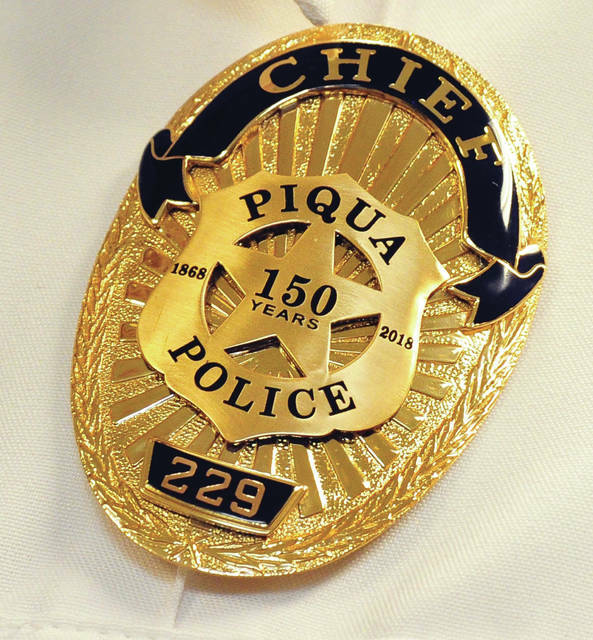 The commemorative badges currently worn by Piqua police officers celebrate 150 years of service and sacrifice. The badges were purchased through a generous donation from the Miami County Foundation. 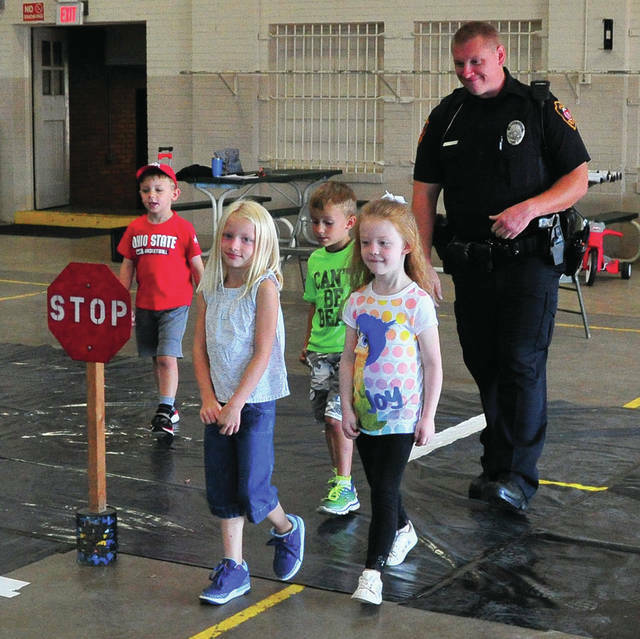 https://www.tdn-net.com/wp-content/uploads/sites/21/2019/04/web1_080817mju_ppd_safetytown2.jpgOfficer Sean Stein of the Piqua Police Department watches as a group of incoming Piqua kindergarten students use a crosswalk and watch out for traffic in Safety Town 2018 at the Piqua National Guard Armory. https://www.tdn-net.com/wp-content/uploads/sites/21/2019/04/web1_Valley2.jpgOfficer Bret Marrs and Chief Bruce Jamison dance with Piqua kindergarten students during the making of the 2018 Our Town music video. 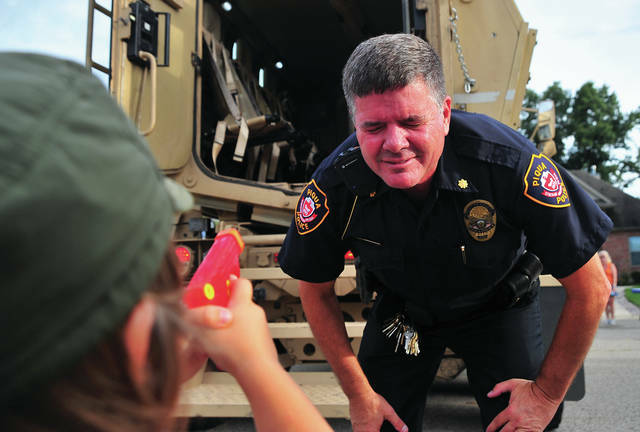 https://www.tdn-net.com/wp-content/uploads/sites/21/2019/04/web1_Valley3.jpgDeputy Piqua Police Chief Marty Grove “loses” a fast draw water pistol competition to a young visitor at the 2018 National Night Out in Piqua. 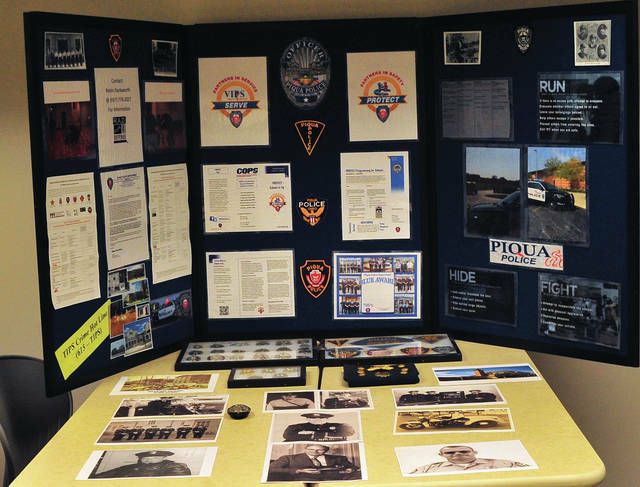 https://www.tdn-net.com/wp-content/uploads/sites/21/2019/04/web1_Valley5.jpgA display of memorabilia looking back at the rich history of the Piqua Police Department is set up at the station. The display depicts historical photos, patches, and badges from the past 150 years. The display also contains reminders of the somber side of police work, including photos of Piqua officers who lost their lives in the line of duty, Detective Bob Taylor, Patrolman Jan Mulder II, and Lt. Noah Studebaker. 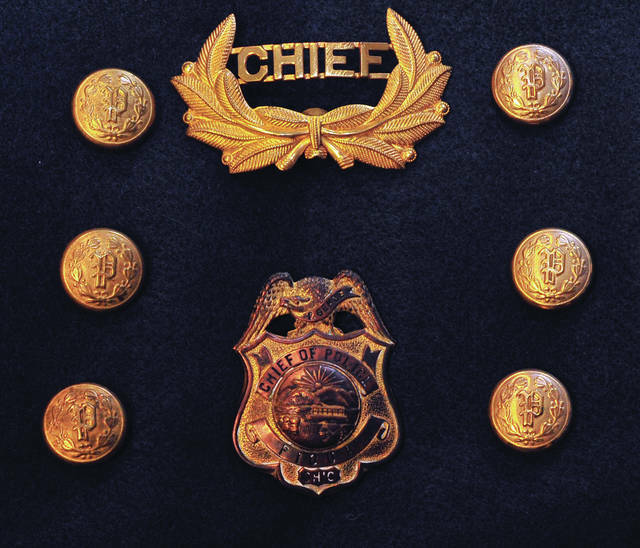 https://www.tdn-net.com/wp-content/uploads/sites/21/2019/04/web1_Valley6.jpgThe badge, and uniform accoutrements, that belonged to the first Piqua Chief of Police, Frank Gehle (1869-1939). 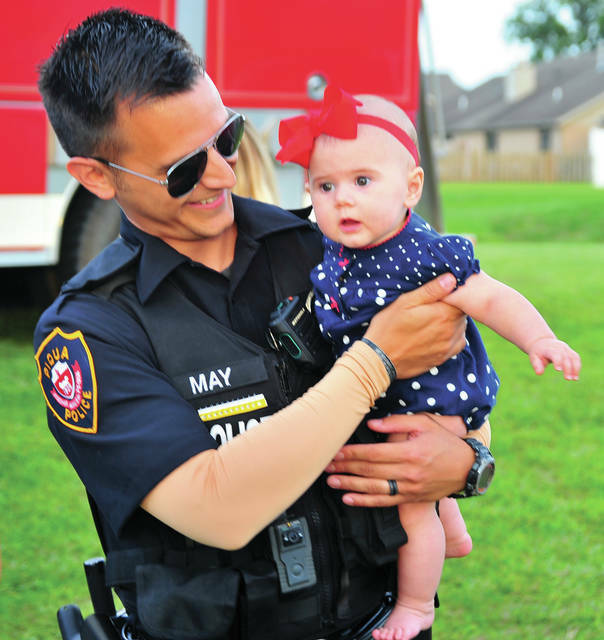 https://www.tdn-net.com/wp-content/uploads/sites/21/2019/04/web1_Valley7.jpgThe commemorative badges currently worn by Piqua police officers celebrate 150 years of service and sacrifice. The badges were purchased through a generous donation from the Miami County Foundation.